When you are beginning your job search, you need all the resources you can get. I’d like to recommend two great books that can help you get off to a great start. The first is Put Your Science to Work, by Peter Fiske. Fiske himself has a PhD, and he has done a great job of putting together specific advice for science grads. This guide is not specific to jobs in the pharmaceutical or biotech sectors, and in fact Fiske encourages science grads to think broadly about how their skills can fit into a wide variety of careers. He explains that while graduate school studies may appear very esoteric and specific, they actually provides students with excellent training in a wide variety of transferable skills that are valuable in a wide range of business contexts. His guide helps science students to take a step back and evaluate their skills and experience in a broader context. His approach is encouraging and optimistic and I think many science graduates would benefit from his perspective on the job search. Well worth buying as a general career guide for those coming from a science background. The second book I’m going to recommend is expensive, but well worth it for those considering a career in pharma. In fact, this book was part of my inspiration for launching this website. Careers with the Pharmaceutical Industry, edited by Peter D. Stonier, gives a detailed overview of a variety of different career opportunities ranging from medicinal chemistry and drug discovery, to pre-clinical and clinical research, sales and marketing, quality assurance, drug safety, regulatory affairs, medical information, medical writing and more. Each section gives background on different roles, including typical entry points and pathways for career development, as well as descriptions of typical responsibilities that give an idea of what “a day in the life” might be like for each position. Each section is written by an industry expert in the particular field. The book is written from a U.K. perspective, which may cause some confusion for North American readers as there are sometimes subtle differences in job titles and responsibilities in the U.S. and Canada, and the suggested resources, such as educational programs and industry associations are also U.K.-centric. Despite this drawback, the book is an excellent overview of some of the diverse opportunities available in the industry, and would be a valuable resource for those trying to decide what role they would like to play. UPDATE: Apparently Peter Fiske’s book is sold out at Amazon! So, unless you want to pay $300 for a used copy (I’d guess not! ), may I recommend an alternative? 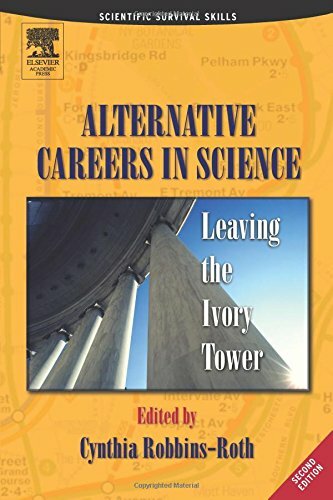 “Alternative Careers in Science”, by Cynthia Robbins-Roth profiles 23 different career paths that a PhD can follow, and includes detailed first-person profiles of various biotech jobs with recommendations on how to position oneself for the transition. Welcome to your first pharma job!